Fell at last move on first try... 2 GO. 15meters short problem. It's never be 8b+. 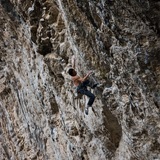 8a+ is maximum for sure. Anyway, good route actually. 8b/b+, or low end 8b+ is possible. But no idea to beat the extension line... it's incredible. 5th GO. Until the 4th clipping from the ground was the crux for me. Especially until the 3rd clipping, guess harder for short people. After that, just stay strong. Good one. Sustain of concentration was the key, until the top that starts from just before the Honky's crux. OSO ONDO!! 8b+/c Original(?) solution doesn't work for me. Developed short people's beta for the crux. Muy guapa y hard one! 4 tries to go, much harder than Queimada! Feel harder than 8b, 8b/+ or 8b+ for it. Big move start at roof and follows technical and sustain, delicate steep top out, good line! 10 tries to send "Fabela" + 9 tries on "Rollito Sharma Extension pa la Enmienda" + 11 tries for as "Fabela pa la Enmienda" = in total 30 tries? Over 50 tries in total (it contains tries of 発情期, 棲龍門 and 空), too many tries, over-graded route for me in this period.